With our city on the rise, NewsChannel 5 found staggering data from the County Clerk's office: the number of motorized vehicles registered in Nashville has increased by 40 percent in just two years. NASHVILLE, Tenn. (WTVF) — With our city on the rise, NewsChannel 5 found staggering data from the County Clerk's office: the number of motorized vehicles registered in Nashville has increased by 40 percent in just two years. Add vehicles that travel in from other counties, plus those that are unregistered, and we are losing space on the roads very quickly. But one local group hopes the warmer weather and some hands-on instruction will convince more folks to turn to an alternative form of transportation instead. 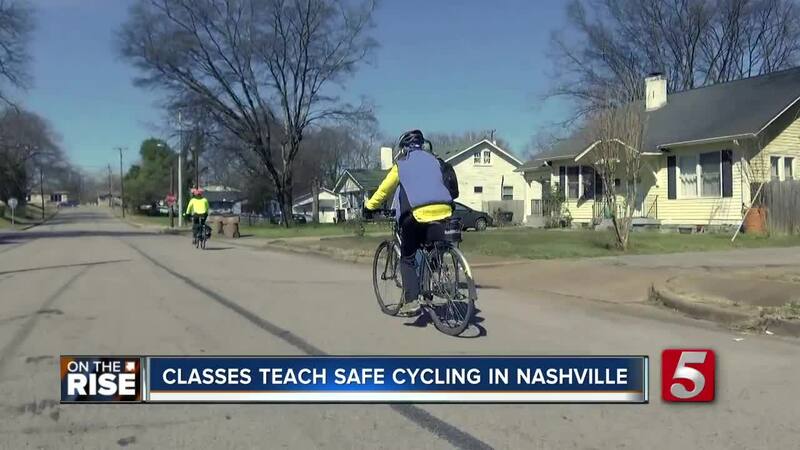 "With Nashville's growth, it's actually an overlooked solution to our traffic issues that we're going to have regardless," said Walk Bike Nashville Licensed Instructor Ryan Kamper. He teachers Cycling 101 and 201. They're classes to teach people who are hesitant how to safely navigate Nahville on two wheels. Kamper says he isn't surprised a lot of people are scared to bike instead of drive. "All of my friends that ride regularly have been hit (by a car) except me," he said. But he thinks changing minds and changing behaviors can change that grim reality. Kamper says the biggest issue he consistently encounters is distracted driving. "Inattention," he said, "texting is an increasing problem. And speeding." So he starts students in the classroom, going over simulations of what cyclists can expect. As you might imagine, it's often the unexpected, such as debris blocking the bike lane or drivers passing incorrectly. Then they hit the road, learning hand signals, going over the rules for cyclists and even learning practical lessons like how to change a flat. You'll see the crew in East Nashville, sporting helmets and bright clothing. They hope the classes can help change misconceptions, like that cyclists are a nuisance that slow down traffic. "They might slow your top speed for a minute, but especially in urban environments with traffic lights and so on, cyclists don't really affect traffic flow at all. In fact taking a car of the road can improve traffic flow," Kamper said. And fewer cars on the road is a concept many in Nashville wouldn't mind driving home. The next class takes place April 27th. Walk Bike Nashville also teaches beginner cycling to adults. You can sign up for one of April's classes here .